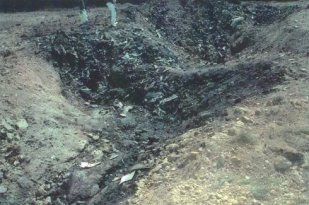 Why Was There No Jet Fuel at the Flight 93 Crash Site? The official account of United Airlines Flight 93 is a remarkable story of heroism and selfless bravery. On September 11, 2001, 46 minutes into its journey from Newark, New Jersey to San Francisco, California, Flight 93 was supposedly taken over by four fanatical Muslim hijackers, members of Osama bin Laden's al-Qaeda terrorist network. Their plan was to crash it into a target in Washington, DC, most likely the White House or the U.S. Capitol building. However, passengers and crew members on board made a series of phone calls to relatives and others on the ground, and were told of the attacks on the World Trade Center and Pentagon. They consequently made the courageous decision to try and retake control of the plane. Following passenger Todd Beamer's now-famous call to action, "Let's roll!" the attempt began. Though they failed to take back the plane, the passengers forced the hijackers to crash Flight 93 into the ground in a sparsely populated area of rural Pennsylvania. All on board the plane were killed, but countless lives in Washington were saved. DEP Secretary David E. Hess suggested a possible explanation for this absence of jet fuel, which was that "most of the hazardous fluids were consumed by the crash's fire." A particular problem with this explanation is that some of the first witnesses to arrive at the scene noticed only very small fires there. Are these tiny fires what we would expect if a large commercial aircraft had just crashed there? And could they really have burned up 37,500 pounds of jet fuel? If the fires had been able to consume 37,500 pounds of jet fuel, surely they would have also burned up all this paper? How do we make sense of this evidence--the absence of jet fuel in the soil and groundwater, yet the mass of paper debris that survived? Was this site really where United Airlines Flight 93--a Boeing 757-200 weighing maybe over 100 tons--crashed into the ground? If this is what happened, it would explain why early witnesses at the scene noticed a particularly strong smell of jet fuel in the air. They later recalled this smell being "overpowering," "incredibly strong," "really strong," or "just horrendous." According to Jere Longman, "The pungency of unburned jet fuel was so strong that it blistered the lips of investigators." Yet, as we have seen, tests found no fuel in the soil. So, rather than being the result of a Boeing 757 having crashed, might this odor have been created by some other means? The purpose was to help create the impression that a plane had crashed, so as to convince the first responders of this, and get information supporting this possibility into initial news reports. By the time--weeks later--that contradictory evidence came to light, the idea that Flight 93 crashed at this site in rural Pennsylvania had become widely accepted, and was deeply entrenched in the public consciousness. New evidence that disproved this idea, such as the absence of jet fuel in the soil and groundwater, could then be ignored as if it were trivial. Yet evidence like this is of critical importance. If Flight 93 did not crash into that field, as was officially claimed, then we need to find out what happened to it, and what the fate was of its unfortunate passengers and crew. "Bush Speaks to Air National Guard." CNN, October 9, 2003. Tom Gibb, "Latest Somerset Crash Site Findings May Yield Added IDs. "Pittsburgh Post-Gazette, October 3, 2001; Peter Perl, "Hallowed Ground. "Washington Post, May 12, 2002. Steve Levin and Tom Barnes, "Flight 93 Relatives Gathering for Service." Pittsburgh Post-Gazette, September 17, 2001; Tom Gibb, "Latest Somerset Crash Site Findings May Yield Added IDs." Tom Gibb, "Latest Somerset Crash Site Findings May Yield Added IDs." David McCall, From Tragedy to Triumph. Johnstown, PA: Noah's Ark Publishing Company, 2002, p. 31. Jere Longman, Among the Heroes: United Flight 93 and the Passengers and Crew Who Fought Back. New York: HarperCollins, 2002, p. 213. Gerard Wright, "On Hallowed Ground." The Age, September 9, 2002. Glenn J. Kashurba, Courage After the Crash: Flight 93 Aftermath--An Oral and Pictorial Chronicle. Somerset, PA: SAJ Publishing, 2002, pp. 38-39. David McCall, From Tragedy to Triumph, pp. 31-32. Jere Longman, Among the Heroes, pp. 213-214. Phil Hirschkorn, "9/11 Panel Describes How Attackers Got Money." CN...; Mike Masterson, "Flight 93: A Hallowed Field. "Arkansas Democrat-Gazette, June 13, 2006. Glenn J. Kashurba, Courage After the Crash, pp. 32, 40, 43, and 64. Jere Longman, Among the Heroes, p. 261. You need to be a member of 9/11 Scholars Forum to add comments! I remember several jetliner crashes before 911 like the everglades crash, and whole warehouse were filled with airplane parts by the NTSB for careful inspection. None of this was done on 911, and that is a dead give away that these Boeings were not crashed in the spots they were reported to have crashed, at all 4 sites. If the official lie was the truth, there is ZERO doubt that they would have had the NTSB assemble all these plane parts in 4 massive hangers and even by now invited the public in to inspect these crash reconstructions to prove the official account true. But every time the govt. has something to cover up, none of these routine things are done.